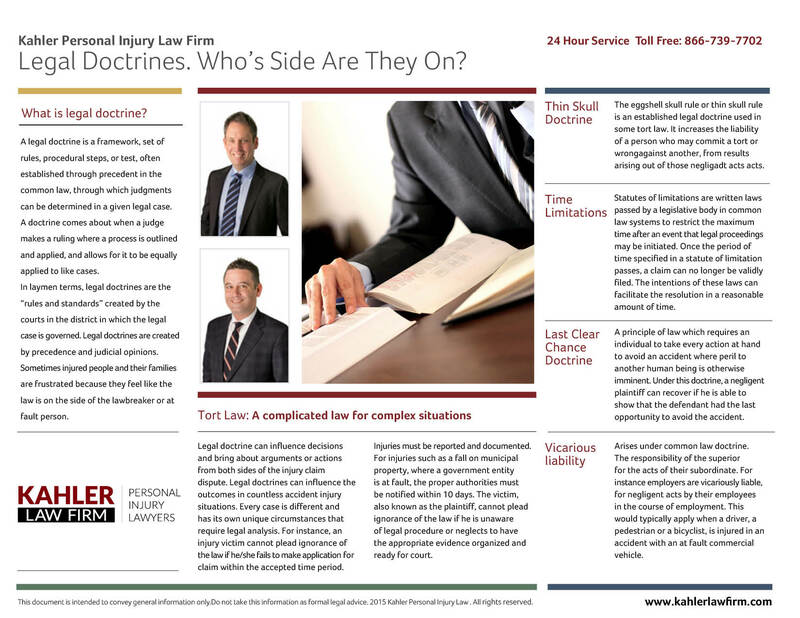 Kahler Personal Injury Lawyers > Blog > Slip & Fall Injury > Tort Law: Legal doctrines, whose side are they on? On their own, car accidents are often extremely complex in terms of the laws governing them. The at fault driver/drivers have insurance that is supposed to cover any injuries or damages caused. For instance, it can be increasingly complicated when a stolen car causes the accident, or a family member takes the car without consent. In some cases the owner of the car does not have insurance or is driving without a license when the accident occurs. Other people may have contributed to fault if they gave consent for use of their car, to someone driving under the influence of alcohol or driving without a license. The details of any accident are rarely straightforward. It may be difficult to establish and prove who is at fault. In some situations there is contributory negligence or liability on each side. We all have a duty of care for our own safety and the safety of others. A speeding car may have caused an accident however the other driver may have been driving under the influence of drugs or alcohol. An injured person may have contributed to their own harm if they were not wearing a seat-belt, or if they knew the driver was impaired. When we assume risk in spite of knowing the dangers involved, we may bare some responsibility for the consequences. In order to assign proportionate amounts for damages, it will be necessary to prove fault and any comparative or contributory negligence. In laymen terms, legal doctrines are the “rules and standards” created by the courts in the district in which the legal case is governed. Legal doctrines are created by precedence and judicial opinions. “Rules” as the word implies are a framework with stringent stipulations that have been determined by the courts. Standards however can evolve over time and are more open to interpretation, legal reasoning and ideological judgments. Sometimes injured people and their families are frustrated because they feel like the law is on the side of the lawbreaker or at fault person. Legal wording is often difficult to understand. It takes energy and knowledge to initiate a lawsuit and enormous financial funding to take on the might of a large insurance company. When a serious injury has occurred victims must deal with physical pain, issues involving medical care, mental stress and healing. Loss of income and financial worries suddenly become a part of life for the injured person and dependents. Fair financial compensation is essential to injured clients and their families, in order to safeguard options for future health and opportunity. In spite of significant importance, there may be little energy, or ability to deal properly with necessary claims. Was there a chance for the victim to avoid the accident? Was there a “willingness” by the injured to enter themselves into harms way? Has the insurer acted fairly with contractual obligations or breached its duty with reckless delay, denial or un-equitable settlement offer causing unwarranted financial or mental anguish upon the victim? Known as the “spoliation doctrine”, parties involved in civil disputes have an obligation to produce and preserve relevant evidence in anticipation of litigation. This may apply when a individual negligently loses or intentionally destroys important evidence, such as car accident scene photographs. The legal doctrines covers can influence the outcomes in countless accident injury situations. Every case is different and has its own unique circumstances that require legal analysis. For instance, an injury victim cannot plead ignorance of the law if he/she fails to make application for claim within the accepted time period. Injuries must be reported and documented. For injuries such as a fall on municipal property, where a government entity is at fault, the proper authorities must be notified within 10 days. The victim, also known as the plaintiff, cannot plead ignorance of the law if he is unaware of legal procedure or neglects to have the appropriate evidence organized and ready for court. Personal Injury Lawyers specialize in defending the rights of innocent people who have suffered injury or damage caused by another person or entity. Even though tort law allows financial damages to be paid, for losses suffered, (see benefits vs. losses) compensation is not automatic or freely given. The burden to prove fault, and consequently rights to benefits, is on the injured person. The defendant either knowingly or carelessly failed to carry out this obligation. In legal terms this is called breach of duty. In situations where injuries have caused wrongful death, surviving family members can build a case for losses suffered. Proving fault with regard to the above points under tort law, would then, become the responsibility of family members with right to claim. The law pertaining to the person at fault. In tort law, the harm must have been caused by some one’s failure to carry out their duty of care or responsibility. Failure to carry out this duty can make the guilty person liable for damages. The legal term for the person at fault in a tort case is “tortfeaser.” The tortfeaser cannot use the defense of not knowing the law. Its important to hire lawyers that are well versed in personal injury doctrine and have the experience to anticipate complications. Its imperative that your chosen lawyer stay current and well informed on changing laws precedence and legal doctrine. An extensive and experienced legal team is required to complete the necessary steps with collecting and carefully analyzing the evidence. The right evidence, along with meticulous legal analysis can help your lawyer anticipate the actions of the opposition, and strategically build a strong case on your behalf.